The Traditional IWB is molded out of a slim yet durable .080 true Kydex. The first thing you will notice with this holster is the contoure of the overall shape. Like all K ROUNDS holsters this IWB is formed not only to the firearm but the human body. The outside contour of the belt helps the operator conceal but also helps to keep the holster in the natural voids of the body. 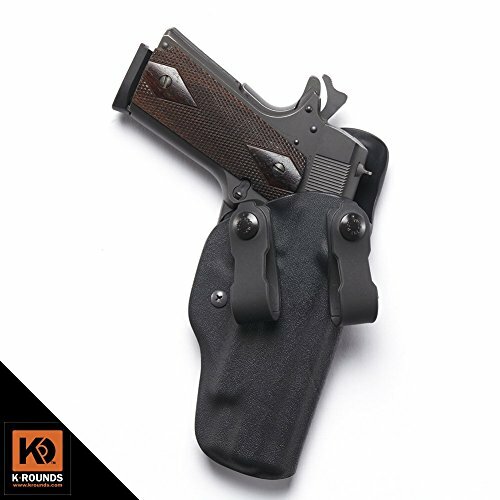 This holster is designed to be worn in the 4 o clock position on the belt for right handed shooters and 8 o clock position for left handed shooters. The soft Injection molded loops feature the security of directional pull the dot snaps making this holster a secure yet easy on and off. When drawing your firearm for the first time you will notice the strategic cutaways. As you come in for the” full combat grip” you will see that the holster is precisely cut away to not interfere with the grip or draw. This holster has an integrated adjustable tension that can be set with any traditional Phillips head screw driver.